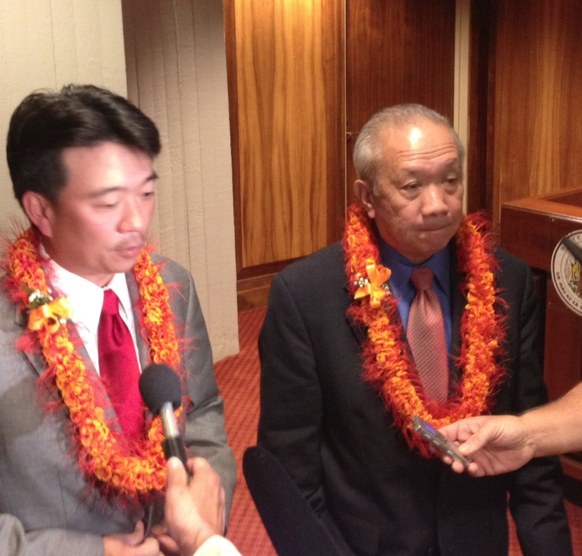 HONOLULU – House Speaker Joe Souki has refused a request to expel former House Speaker Calvin Say. He doesn’t live in his district, say the six voters from Honolulu’s Palolo district who want him out. The request followed a Sept. 30 ruling by Circuit Court Judge Karen Nakasone that dismissed a lawsuit — Hussey v. Say— challenging Say’s residency. Nakasone maintained Hawaii courts don’t determine the residency qualifications of legislators. Collins plans to appeal. Say, Hawaii’s longest serving House Speaker, has been in office since 1977, 14 years as the highest-ranking House member. He maintains his residence is in Palolo but acknowledges he spends time with his family in another home outside his district. Hawaii’s constitution requires that all lawmakers also be qualified voters living in their respective district. Souki said in an Oct. 17 response the House can’t comply with Collins’ request because its session starts January, and it cannot unilaterally call a special session. Every House member is up for re-election. On opening day in January the House credentials committee will review qualifications for all new House members, Souki said.